The first thing that God created was angels, and I have shown you, and this is so important, I want to repeat it again. I want to repeat this, as Franklin D. Roosevelt would have said, "Again, and again, and again," because I want you to really get it. The one thing that God Almighty cannot create direct and by fiat, is perfect spiritual and holy character. That is something that must be developed. That is why we are on Earth. But first God and the Word created angels. Then they created the physical universe that is described in Genesis 1, verse 1 (Genesis 1:1), the very first verse in all the Bible. And at that time, however, as you'll read in the 38th chapter of Job (Job 38:7), the angels were already here, and they shouted for joy at the creation of this Earth, because it was to be their home, their habitation. Before Adam, before the first human being ever appeared on this Earth — suddenly created as a whole, mature man, and did not come up by process of evolution — there were angels who inhabited this Earth. I read to you in II Peter of how the angels sinned. In other words they rebelled against the law of God. God put his government over them. Now the government of God ruled the entire Earth at that time. And God placed a super-archangel to rule. His name was Lucifer. Lucifer was the highest creation of angel that God himself could create. He was a super-archangel. However, God could only instruct him in the right way, but he had to leave the choice to him, because otherwise there could be no character. And Lucifer chose the wrong way, and he led his angels into a rebellion. And the government of God was taken away from this Earth, and that left only God who had the type of character that would not — and because he would not, could not — commit sin, and go the wrong way. Now sin is the transgression of that law that is the basis of that government of God. And it is a way of life. It is the way of love, of outgoing concern to want to help everybody else, the way of cooperation, the way of giving instead of getting. Now this Lucifer turned to the way that we now call human nature, and it came from him and not from God, and it is the way of vanity that exalts your own self and debases others, to try to mount up above others. I remember so well a motion picture. I think it came very shortly after World War II. And it was a picture of Hitler and Mussolini. Who took those parts? I think Charlie Chaplin took the part of Hitler, and Oakie, what was his name? He took the part of Mussolini. And anyhow, here was Hitler and Mussolini and one of them was visiting the other, I don't know whether they were in Berlin or down in Rome, but anyhow, they had the private barber shop of the Fuhrer, or of the Italian leader. And it has a two-chair barber shop. That reminds me, really, the one in Ambassador College in Pasadena, the men's' barber shop is a two-chair shop, and, which I have used many, many times. Well anyway, in this thing, Mussolini reached down on the lever and jacked it up to lift him about half an inch higher. Hitler saw it and he took and jacked his up two times, to make him a little higher than Mussolini. Then Mussolini raised, jacked himself up a little higher, and then Hitler a little higher, and then they kept on till they both hit the ceiling on top. Now that was laughable, but it shows you that little quirk of human nature, of everyone wanting to make himself a little higher than everybody else. Satan — "The Prince of the Power of the Air"
And that, as I say, I haven't time to explain too much of that in this program, but that really has come from Satan, who is called in the Bible the prince of the power of the air. Now we get through the air, and I know that probably every one of you in this country have a television set or two at home, and you tune in, and there comes the picture and the sound and the voices, the music, the whatever, and it's just coming through the air. You may have an inside aerial just above your set, or you may have one upon the roof. But let me tell you, in this room where we are right now, there are many voices, only your ears can't pick them up, because they're not tuned to the right wavelength. And you don't hear them, but you bring radio sets in here, and tune them into a number of different radio stations, and get them on the right wavelength, and you can boost up the sound, and you'll find that you have a great conglomeration of singing, of speaking, and of every kind of noise. It's in the air, but we're not hearing it. Now it's marvelous, the things that we can send through the air today. Did you ever stop to think about that? We have come to the time — most of the inventions and the things we have, have come in my lifetime. I tell you, back when I was a little boy, we were still in the horse-and-buggy days. We had just gotten rid of the horse-drawn streetcars, and had the first little (what we called "little dinky") trolley cars, in Des Moines, Iowa, where I was born and reared. And I remember when the first automobiles came. We called them horseless carriages, and that was quite a sight. And if an automobile came past the house, everybody would run to the window to see it. Now we often called them horseless carriages because some of them, they just took carriages and put a motor in it, and they put a stick to turn one — it wasn't a wheel to steer it, but a stick that would turn one way or the other. And I suppose most of you are not old enough to remember having seen one of those, but they called them horseless carriages because they had just taken a regular carriage and put a motor in it, and it was running. Well, one day when I was 11 years old, I remember my father said, "Hey, everybody come quick! Here's a horseless carriage going by!" And the whole family came running up to the front window and sure enough, there was a horseless carriage. It was a carriage drawn by a mule. And my father had a great laugh. How does the human mind differ from an animal brain? An animal just looks with dull eyes, and he's not thinking because he doesn't have thinking capacity, but he has a brain just exactly and precisely like a human brain. Now they have taken apart the brains of whales, of elephants — they're all a little bit larger than human brains — and then of a chimpanzee, which is just slightly smaller, but all of them are just exactly alike. And the human brain is not even probably 5% superior, physically, and in the physical brain itself. Why then do we have the ability to think, and to think creatively, to reason and to make decisions? I'll tell you why. First, it's because God knew that he wanted to develop character within us, and in order to do that, he put a spirit within every human being. Now that spirit is not a person. It is not an immortal soul. It is merely spirit essence, just like a handful of air. You remember Solomon had tried everything and every pleasure in the world, he'd built great projects for his nation, and he wanted to see what life was like, and he finally ended up saying that everything was vanity. He said it was like grabbing a handful of air, and what have you got? Nothing. And it's time that many of learned that lesson. Solomon learned it a long, long time ago. But the spirit in every one of us is just like so much air. It's not a person. It cannot think, it cannot see, it cannot hear. Your physical brain sees through the eye, your physical brain hears through the physical ear, and it is your physical brain that does the thinking, but the spirit in every one of us transmits the power of intellect to that physical brain. Now, where did Satan come from? This Lucifer that was set as a super-archangel over the angels of this Earth before man was put here, was said to be — and I read that scripture in the first one of the present series of programs — that he was perfect in all his ways from the day he was created. He was not born. He was a specially created being, and he was perfect in his ways as God created him. But it says, "till iniquity was found in him." Now God had told the angels the right way. He started this Lucifer out on the right track. But he turned, and all of his angels, he turned his angels into rebellion against God instead of going the way of God. In other words, God's great law, the foundation of his government, was the way of love, the way of giving, the way of cooperating, away from self, not incoming but outgoing, and the way of helping, of concern for the welfare of others and not just for yourself alone, the way of humility instead of vanity. God had a great job he wanted those angels to do, but they, they sort of flunked out on the test. And they disqualified themselves to go on. The job he had is a job that now is the potential of human beings, and the great potential that is ahead of us now, and that is that we are to go to the planets all over this vast universe and complete their creation, and turn them from decay which has come as a result of the sin of those angels and the sins of men, and turn them into production and into beauty, and turn darkness and ugliness into beauty. God is the author of beauty; Satan is the author of ugliness. Now this Lucifer that was the super-archangel — God changed his name to Satan the Devil. "Satan" means... Lucifer, let me tell you first what his name "Lucifer" meant — "cherub" or "shining star of the dawn." It meant he was a bringer of light and truth. But "Satan" is just the opposite. It is a rival, an adversary, or an enemy, and that is the meaning of the word "Satan the Devil." Now this Lucifer became Satan. He is an immortal being, and his angels became demons, and they get into people. I have cast a few of them out of people when they were in, and freed those people from that thing, because a demon can get into people and take control of their minds. Now don't get alarmed, because a demon cannot get into you unless you completely lose your head in a rage of anger, until you've lost all control yourself, and, or else you are seeking a spirit like some people that instead of seeking the Holy Spirit of God, they just want to seek (as they call it) "the spirit." And they agonize and everything, and let any old spirit come into them, and that's what does it. Demons finally can. Now I don't know of any other way a demon can get into you, so you don't need to worry, because if you don't do one of those things, no demon can get into you. But demons do get into people. Now in the 6th chapter of Genesis (Genesis 6:5), God saw that (and this is about 1900 years later, almost 2000) "God saw the wickedness of man was great in the Earth, and that every imagination of the thoughts of his heart was only evil continually." Now God called Noah. Noah wasn't seeking God, but Noah was a man who wanted to be righteous. He was the only man that was pure in his generations by birth. So God now called him out of the world, and says, 'Noah, I've got a job for you. I want you to build a great ship,' and it's called an ark in the Bible. And he said, 'I'm going to bring a flood on this Earth. And this ship will save you and your entire family, because of you your family will be saved out of it.' Otherwise no flesh would be saved alive, even then. Noah did obey God, and built the ship. He must have, well I imagine that people all around him must have jeered and mocked him, and ridiculed him. "Why, look at the great crazy fool! Building a ship right out here on dry land! There isn't any ocean here, there isn't any water. Where's he, how's he going to get this over to the water?" Well, the water came and drowned them. 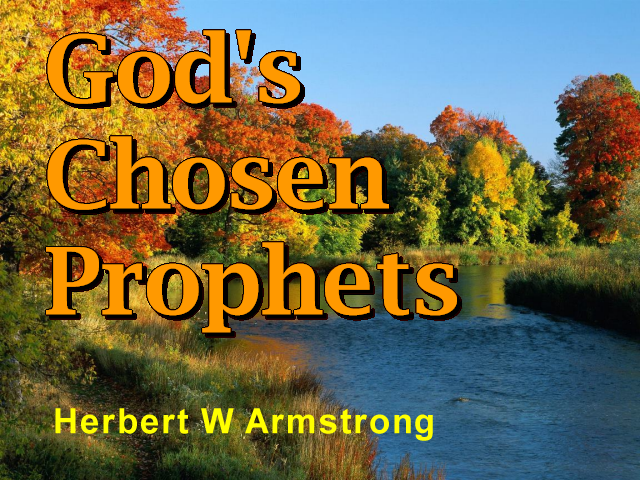 Now, the next case we have of where God intervened in the world to call some for himself out of Satan's world is in the 12th chapter of the book of Genesis (Genesis 12:1). "Now the Eternal had said unto Abram," or Abram if you prefer to call it that, "Get thee out of thy country," he was living in the country of all the bright lights of that day, the gaiety and the pleasures of Babylon. And God says, 'You get out of here and to come out.' And really, disciples today are the come-out ones, the ones that come out of this world. "Get thee out of thy country, and from thy kindred, and from thy father's house, and unto the land I will show thee." Now there none of that kind of pleasures over in this land where he was to go. Well, it just says: "And Abram went" with no argument. In so many cases, when God had something for a man to do, he wanted to argue and he didn't do it. But Abram did not. It's all about the only case, I guess, in the Bible like that, where he just agreed to do what God had called him to do at the time, without quibbling about it one way or the other. God said, 'I know that, and I have provided for that, I have provided to have your brother go along with you, and "he will be your spokesman, and he will speak for you." (Exodus 4:16). 'Now you can stutter yourself out until he understands, and then he will speak to the people for you. There were 600,000 men, not counting women and children. So if you add another 600,000 women, that's a 1,200,000. Now adding the children, and there were not less than 3 or 4 million of those Israelites. Now that is a lot of people, and Moses led them out. Of course, God performed miracles at the Red Sea, and all of that, but God led them out. And they came finally to Mount Sinai. There God himself gave them the Ten Commandments, and they all heard the voice of God. They did not get the Ten Commandments from Moses. The people got the Ten Commandments direct from God. Moses was standing there with them at the time. However, God through Moses made a proposition. But listen, brethren, listen. God did not promise them spiritual salvation, not at all. That was only to Moses, later to the various prophets. Well, now and I want you to notice that the rest of the world all this time didn't know anything about God. They went out and formed their own governments, and their governments that got into wars, once against the other, because they weren't trying to give, they weren't trying to cooperate and help, they were trying to get from the nation. They were getting into quarrels and disputes, and they would invade in order to take away from the other. God wanted Jonah to go and warn Nineveh of the destruction that he was going to send to them, but if they would heed the warning, it wouldn't come. But Jonah tried to run away, he didn't want to do it. Notice that usually the men God calls don't want to do it. They want to run the other way, and this Jonah tried to run away in a ship. And he got on a ship, and God had him thrown overboard, and God had prepared a great fish just to swallow him up. The Bible does not say a whale, but God prepared a great fish. There had probably never been a fish like that before or since. Anyway, it swallowed him up, and it was like being in the belly of the grave. And anyway, finally, Jonah there agreed that he would do what God said, and so he was, it was a type of the resurrection of Christ after three days and three nights. And he was vomited up, and then he did go and he delivered that warning, and the city of Nineveh was saved. Now after Jonah, and also after Moses, we come on down to the time when the children of Israel were governed through the prophets that God had called. Next came Joshua, and after that were the different so-called judges, or heroes, or ones that God called to deliver Israel at different times. And then we came to Eli the prophet, and Samuel was reared under him, and God rejected Eli because he allowed his sons to go contrary to God, and he didn't correct them. Now we come down to the time of Samuel. Samuel had the spirit of God. Samuel, though, was the one God was using to rule this people that he had called out of the world, and separate from the world. Now we come to the 8th chapter of Samuel, and beginning with verse 4 (Samuel 8:4). "Then the elders of Israel gathered themselves together, and they came to Samuel unto Ramah, and they said unto him, Behold, thou art old, and thy sons walk not in thy ways. Now make us a king to judge us like all of the nations." In other words, they wanted to become more secular. They wanted to get away from God's ways and they wanted to be like the world, like Satan's world outside, and people are always like that, and they're getting that way today. "But the thing displeased Samuel," and he went to God, "and the Eternal said to Samuel," well, "you listen to the voice of the people in all that they say to you, for they have not rejected you, but they have rejected me," God, "that I," God, "should not reign over them." God spoke to Jeremiah and said, 'I'm calling you out, and giving you a special call, and I want you to go before kings and people.' And he said, 'Oh but Lord, I can't do it. I'm just a youth, and I'm not old enough, and I can't do it. I'd be afraid of their stern faces.' And God says, 'Don't fear their faces. I will be with you, and you will do what I tell you.' And he did. Now it has been that way all the way along. Now I'm going to leave you with that, but I have shown you that those that God calls, that he wants, tried to get away and run away like Jonah. They didn't want to accept it. And I didn't. I'll tell you, after I had been converted, it took about two and a half to three years of other people, several of them pleading with me, to preach. And I wouldn't do it, for two and a half or three years, before I finally found something that I just knew the people ought to hear. And I wanted them to hear it so badly that I finally gave in for the first time. I had spoken for them, and my wife at that time didn't call that a real sermon, but I had something to say. I will say that, I had something to say. And they thought they'd heard a good sermon, even though the delivery wasn't much like a sermon. Well, I say goodbye now. This is Herbert W. Armstrong, saying goodbye until the next time.